One of three musical brothers born in Nuremberg, Hassler studied under Andrea Gabrieli in Venice before returning to Germany where, in 1586, he was appointed chamber organist to the wealthy Fugger family in Augsburg. 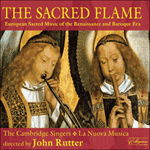 He published his first collection of sacred music, dedicated to his patron Octavian II Fugger, in 1591; it was evidently successful, with a new edition appearing in Nuremberg in 1597. Hassler seems to have had a restless and entrepreneurial streak, moving to new posts in Nuremberg in 1601 and Dresden in 1608, while being involved in instrument making and music publishing. Much of his music is popular in style: Dixit Maria (from the 1591 collection) is written in the secular style of a canzona or chanson rather than a motet, with a typical ABB structure, an attractive melody starting with the characteristic long–short–short canzona rhythm, and simple, clear counterpoint. The piece is designated for the Feast of the Annunciation.